Building upon the award winning success of Cut Muscle design, the Mizuno product development team evolved this game changing technology to now include FORGIVENESS. The new MP-60 Cut Muscle™ Cavity continues to maximize the performance for today's more aggressive game. The Grain Flow Forged MP-60 is 4% larger and has a 10% larger sweet area when compared to its outstanding Cut Muscle counterpart, the MP-32. 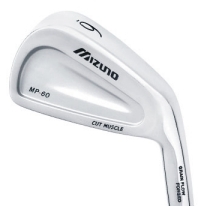 The Cut Muscle design in the MP-60 delivers a slightly higher ball flight in the long irons, and a mid trajectory in the scoring irons, while the Cut Muscle design precisely positions the COG in each club for a consistent and predictable ball flight. The MP-60™ is the next generation of game-changing Cut Muscle Design Technology; award-winning performance with added FORGIVENESS! Innovative Cut Muscle Cavity™ design provides ideal COG locations, perfect trajectory, enhanced solid feel, and increased forgiveness. Grain Flow Forged™, 1025 select mild carbon steel provides the ultimate soft, solid, consistent feel.